The public has not forgotten Puerto Rico, and neither has Patrick McGrath Muñiz. After experiencing Harvey in Houston, and witnessing Hurricane Maria passing over Puerto Rico and Irma in Florida, where most of his family and friends live, the issue of climate change has become even more personal for the artist. A Houston transplant, Muñiz lost his studio in Puerto Rico during Hurricane Maria, along with all the artwork in it. In a way, this tragic loss fuels his passion even further. Alba’s Dream is the first painting I did right after finding out about my lost studio in Puerto Rico. A woman rescuing a dog from the aftermath of a hurricane is inspired after my cousin Alba Muñiz, who has saved the lives of many animals in need through the Santuario de animales San Francisco de Asis. This and many other stories have really moved me and restored my hope in humanity despite all the political, environmental and social storms we are living through these days. The “unfinished” monochromatic background represents the unfinished job of rebuilding our country after a natural disaster. 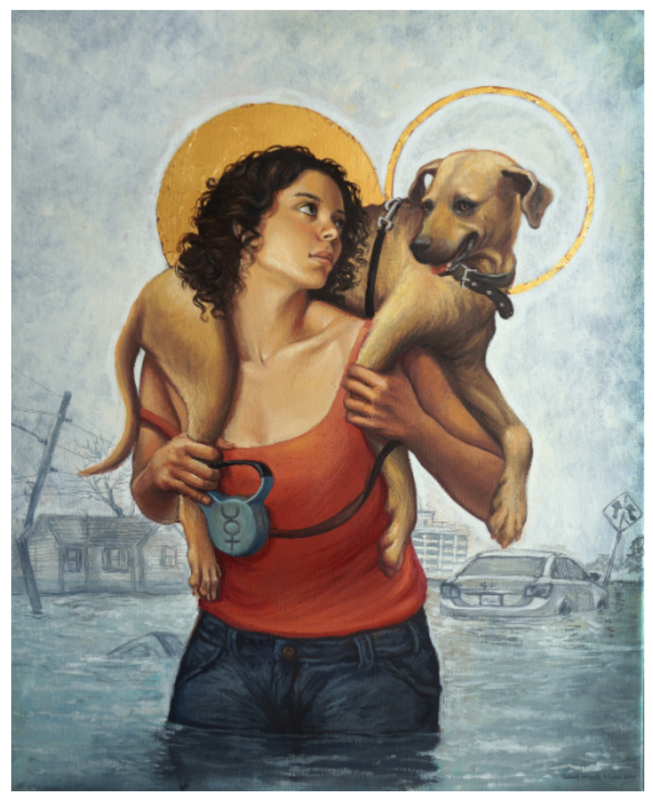 Our heroine is defined and in full color as well as her dog, reflecting determination and vitality. The gold haloes on both figures imbues the narrative with spiritual significance while sanctifying not just the girl but her dog. The Symbol of Mercury/ Hermes, the god of travel and communication on the dog leash is often association with the “Dog headed” Saint Christopher. It was Naomi Klein who first clearly explained the shock-doctrine: the exploitation of national crises to push through controversial policies while citizens are too emotionally and physically distracted by disasters or upheavals to mount an effective resistance. 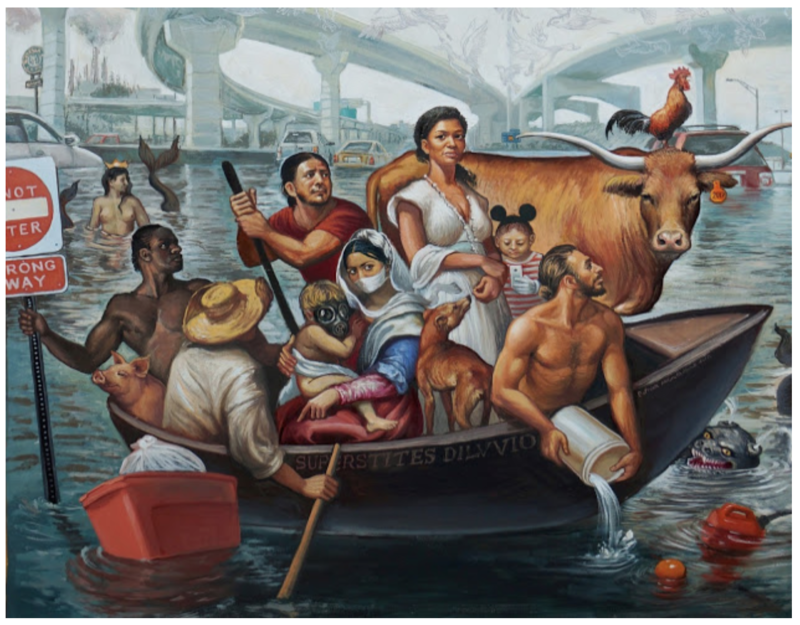 Muñiz’s art makes this exploitation obvious, exposing the cruelty of disaster-capitalism for all who have eyes to see. Privatization is an instrument of mass destruction, leaving behind an even greater magnitude of suffering than nature’s storms. Muñiz’s work does the talking for him. One thing rings true for me: water is a threat to life – an existential threat – as is the exploitation of the victims of natural disasters. And this is caused by human activity, the pursuit of profit at the expense of everything – the air and water, people, flora, and fauna. All life is threatened. Diluvium (above) was painted a month before Harvey and exhibited at the Evoke Contemporary in Santa Fe, NM in July. It’s a prophetic warning of the Houston flood experience. The fears of society lie just below the surface of the flood waters that have turned the freeways into rivers. Industrial smokestacks continue polluting the air. We – humanity – are all in the same boat. Trouble ahead. The child with the Disney/Mickey Mouse ears is oblivious, distracted by a mobile device. Santa Justicia (above) is driven by a righteous anger. The shamefully slow response from the U.S. government in Puerto Rico stands in sharp contrast to the rapid response in Texas. Muñiz reminds us that Puerto Rico is an American colony and the people from Puerto Rico are American citizens. It is the responsibility of the U.S. to take care of its territories and peoples. 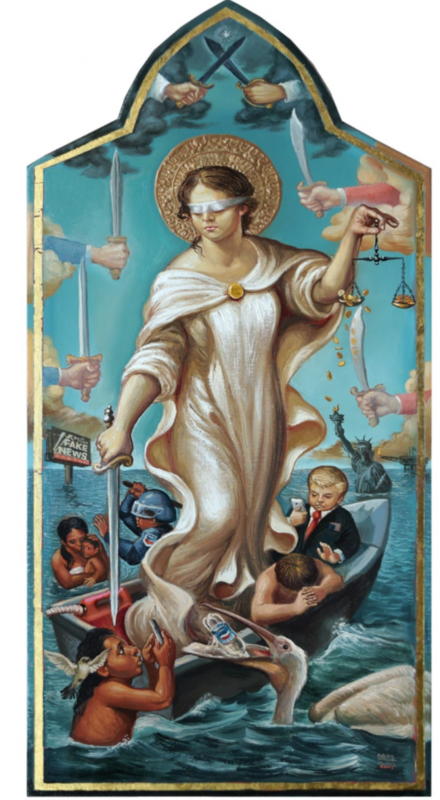 Note the scales of justice being tipped by the weight of gold and the threat of violence. The pelican is swallowing a plastic Pepsi bottle (yes, life imitates art). A private military contractor threatens an indigenous woman and her child (yet again, life imitates art). 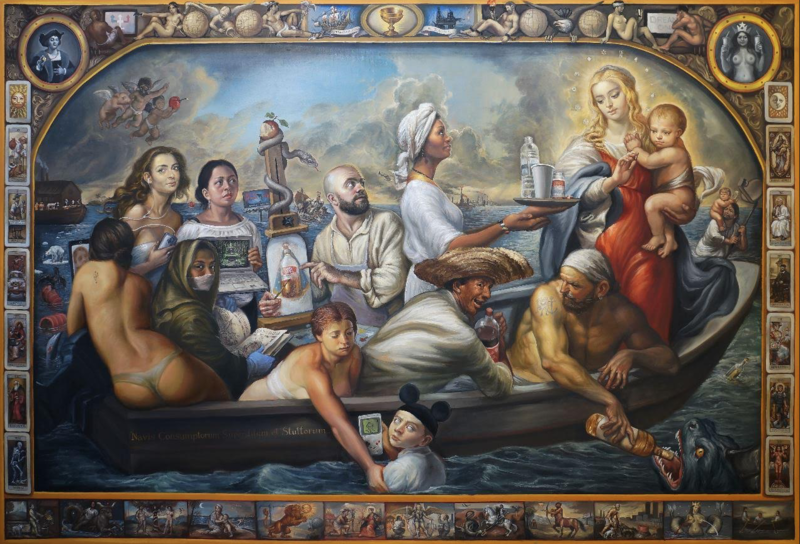 The Vessel (above) is a work painted two years before hurricanes Harvey and Maria – a predictive painting that shows the future before it happened. Looking back, what struck me the first time I met Muñiz at the Lawndale’s Big Show 2017was his intensity – and the iconic nature of his work. 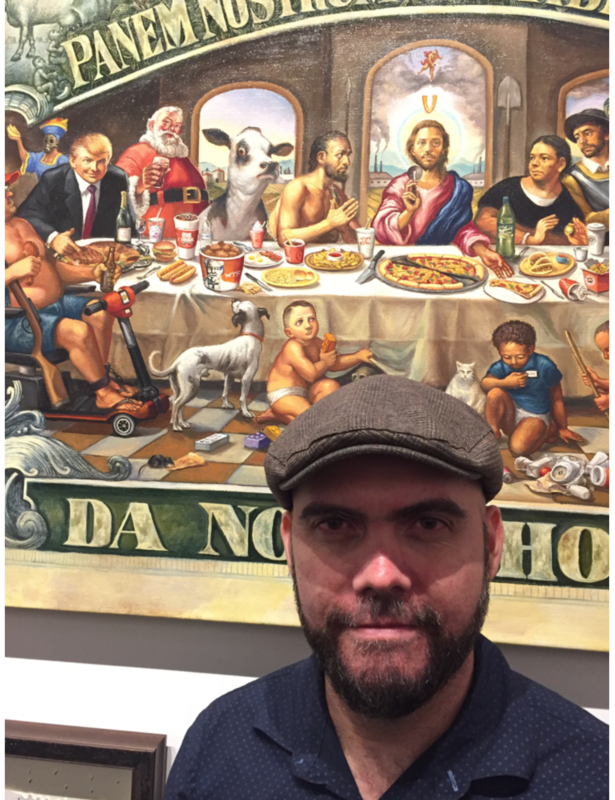 Here is the Catholic sensibility in art turned upside down: a sacred style used to illuminate the profanity of runaway capitalism and its effect on the planet. The artist is a prophet, warning society of what lies ahead. Just to be sure, let’s ask: what is the role of the artist in this age of destruction?